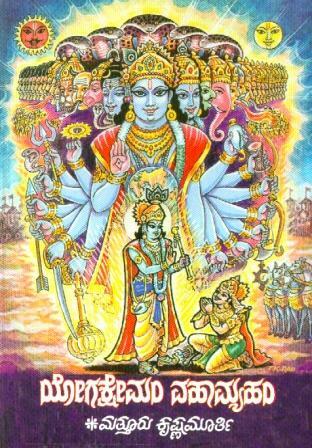 Yogakshemam Vahamyaham is a prize winning brilliant treatise on Bhagavadgita. Mathoor Krishnamurthy who is an acclaimed preacher of Bhagavadgita, tries to relate the day today happenings and differences of our modern day life to the words spoken by Krishna in the great epic. This book is also a collection of articles which had appeared in the popular Kannada monthly magazine 'TUSHARA' as a series for 35 episodes. 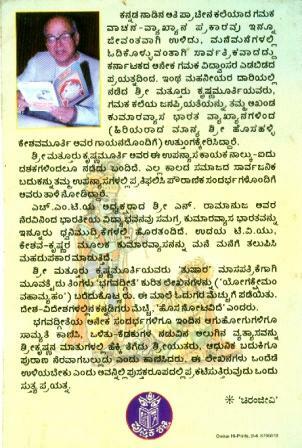 This book has also won a prestigious award - GOROORU Prashasthi. For postage and bulk bookings please contact us directly.